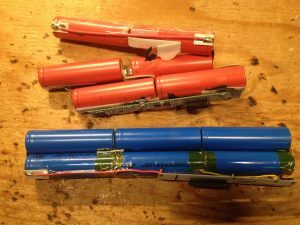 Old laptop batteries are a great source of Li-ion batteries, as long as you know how to properly test them to make sure they are safe to use. In a typical laptop battery, there are 6pcs of 18650 lithium-ion cells. An 18650 cell is just a cylindrical cell with a diameter of 18mm and height of 65mm (approximately). If the laptop battery no longer works, there is usually just 1 group of cells that died, and the other 4 are still perfect, but you have to reliably test them all to make sure they work. All my cells are tested with my 18650 testing station shown here. To get the cells out of the laptop battery, all you need to do is break off the plastic casing. There are various methods that work here. Make sure to wear gloves and safety glasses – parts of the plastic casing can fly off, and are pretty sharp. The nickel tabs connecting the cells together are very sharp and can cut you very easily, as I have found out too many times. 1 – If you can twist the plastic casing and break it apart, then that is the best way to do it. This does not work on all batteries, and I am usually only able to do it on 3 cell Dell packs. 2 – Get a durable pair of wire cutters and/or pliers and try to break the corners off, or split it at the seam. 3 – Hitting the pack against the ground is a pretty good way to get the cells out. You might damage some of the cells, but this is one of the quickest methods of removing the cells. Once the cells are freed from the plastic casing, you can get to work separating them into individual cells. They are usually spot-welded together in a 3S2P configuration (for a 6 cell pack). Cut all the wires going to the PCB one at a time to avoid shorts. The best way to get the spot-welded nickel tabs off the cells is to twist them off. Grab it with a pair of pliers or flush cutters, and sort of roll it up. 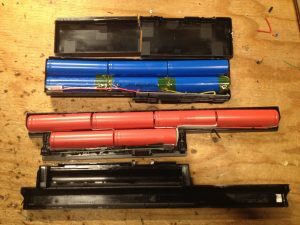 Be careful not to make any short circuits with the metal tools – the entire casing of the battery is the negative terminal, so if the heatshrink around it is broken, it can be easier to create a short circuit. The first thing I do when all the cells are freed, is to do a quick voltage test. If the cells are over 2V, then they can go straight to charging in TP4056 chargers, or Liitokala Lii-500 testers. If the cells are under 2V, I mark them with a ‘V’, then charge them up with TP4056 chargers. Once the cells are fully charged, I let them sit for 24h, then measure the voltage again. If any cells discharge themselves just by sitting there, they will be weeded out here. Some people would recommend a week, others up to a month before testing them again, but for me, 24h is a fairly good amount of time. If any of the cells are under 4V at this point, then they are considered self-discharging, and are discarded. Any cells that passed the first two tests are now tested for capacity in Liitokala Lii-500 testers. OPUS BTC3100 are another common tester, but are more expensive than the Liitokala Lii-500, with the same functionality. They are charged, then discharged while measuring the capacity, and finally charged back up again. I write the capacity on the cells, and then sort them based on capacity. Under 1000mAh are discarded, and the rest are separated into 1000-1600mAh, 1600-1800mAh, 1800mAh-2000mAh, 2000-2200mAh, and 2200mAh+. 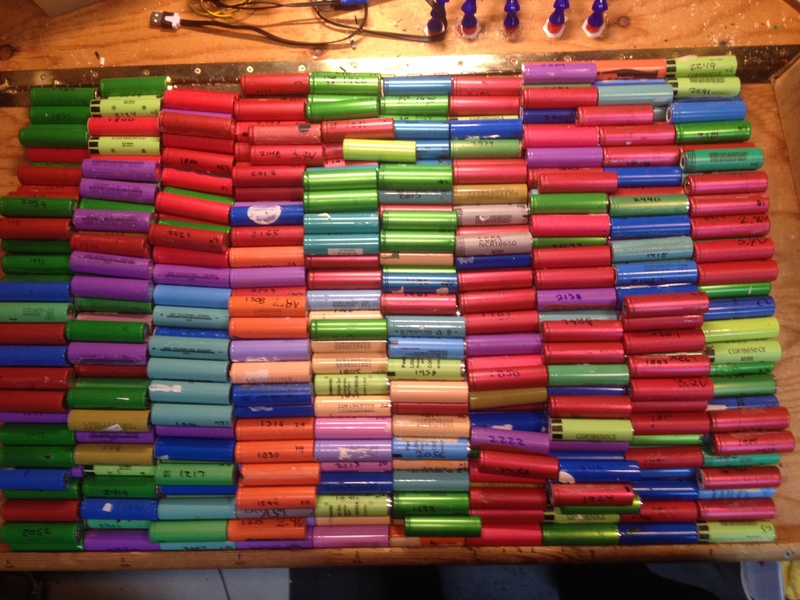 I would recommend only using cells over 1800mAh in final projects, and using discarded cells as practice for soldering. The last thing to determine the health of a cell is the Internal resistance. The Liitokala Lii-500 tests the internal resistance of a battery each time you put it in, but I sometimes do another test with my homemade Arduino IR Tester. This test is not really that important if you are using cells in low power applications (<1A per cell), but in higher power applications (1A+ draw per cell) it is more important. The higher the internal resistance of your cells, the more they will heat up as you charge or discharge them. The extreme cases can be caught just by monitoring temperature during the charge and discharge processes. Throughout all these tests (particularly charging and discharging), I monitor the temperature of the cells. If any cells get over 40 degrees Celsius, they are marked as with an ‘H’, as heaters, and are brought back to the computer recyclers. Red Sanyo cells have a high tendency to heat up. I have recovered over 2000 cells following these guidelines, and have been fairly successful in determining which ones are good. One word of caution though – Any cells that do no come from a reputable manufacturer – Samsung, LG, Panasonic, Sanyo – are more likely to fail even if they test good. Of all the cells I have used, only a handful of knockoff Chinese brands – SZN, CJ – have failed. Have a look at my battery testing station here. 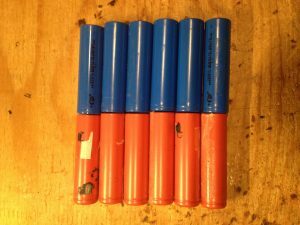 This method is by no means the best, most complete and accurate way of testing 18650 Li-ion cells, but it is just my take on it.